Since Spoonflower’s digital printing process is just a bit different from the way most commercial fabric from a fabric store is printed, your fabric may look a little different when it arrives. In today's Bootcamp post, help team member Emma shares the ins and outs of terms like ‘printable width’, ‘selvage edges’, and figuring out just what “stretches on the crosswise grain” means. 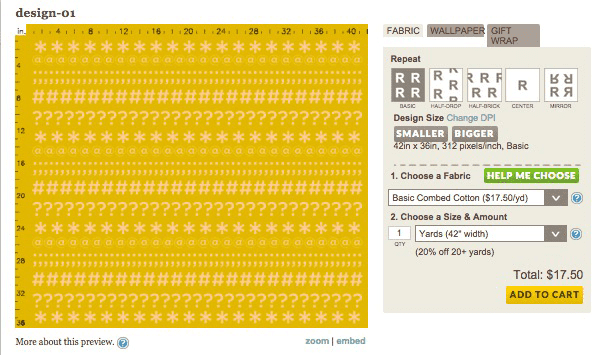 One of the most common questions we get here at Spoonflower is which way does the design print on the fabric? We have a handy-dandy preview on our site that can help answer this question: it updates to show you exactly what a fat quarter will look like if you select ‘fat quarter’. If you enter ‘2 yards’, you’ll see a view of two yards. This is true for every amount under 5 yards (if you enter more yards than 5 into the box, the preview will continue to show you 5 yards, regardless of the amount you enter). We’re now on day three of the 12 Days of Giveaways and we’re delighted that the kind folks at UK-based Selvedge magazine have offered up a full three years’ subscription to their gorgeous magazine. Selvedge is published bi-monthly and “offers the world's finest textile photography, unparalleled design and peerless writing. Directed towards an international, discerning audience, Selvedge covers fine textiles in every context: fine art, interiors, fashion, travel and shopping.” We’re lucky enough to receive a subscription here in the Spoonflower office, and we love the beautifully broad overview of the world of textiles that Selvedge provides in each issue. We promise that your eyes will be opened! The winner of yesterday's modern quilting library is Brooke Jones, whom we will email shortly. Congratulations, Brooke! To win, just enter before 8:00 am EST tomorrow. We’ll announce a winner later tomorrow morning, so please check back for that news and for day four’s fantastic prize. Good luck to you all!